Romney Calls For A Bigger, Stronger Military In a speech at The Citadel on Friday, the former Massachusetts governor known more for his business acumen than his foreign-policy experience said he wants to increase the military budget. A weaker military and a smaller global footprint, he argued, will compromise America's leadership in the world. 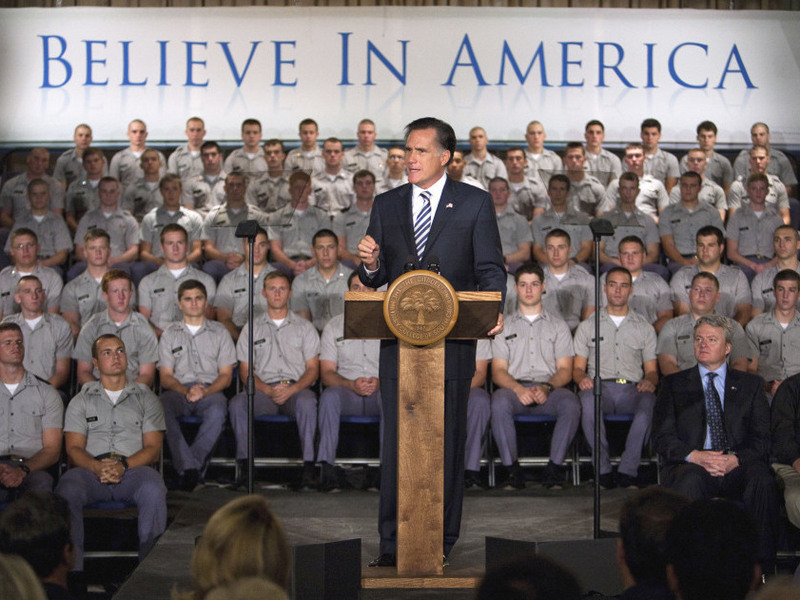 Republican presidential hopeful Mitt Romney speaks to Citadel cadets and supporters on campus Friday in Charleston, S.C. The former Massachusetts governor, known more for his business acumen than his foreign-policy experience, sought to show he has what it takes to be commander in chief. There is a tradition of Republican presidential candidates laying out their foreign-policy views at The Citadel. John McCain did it four years ago; George W. Bush did it eight years before that. On Friday, it was Mitt Romney's turn to speak at the South Carolina military academy. "Since 1842, every tyrant, every petty thug or great power that threatened America learned that if you wanted to take on America, you were going to have to take on The Citadel as well," the former Massachusetts governor said, surrounded by cadets in front of a big white banner that said "Believe in America." Romney described how he plans to keep America from losing supremacy in the 21st century in a speech covering the globe — from Mexico and Cuba, to Afghanistan and Pakistan, Iran, North Korea and China. That broad sweep is a reflection of the world today, he said. "There's no wall that the next president can demand to be torn down," he said. "But there's one unifying thread that connects each of these threats: When America is strong, the world is safer." Other Republicans in the presidential field have argued that America needs to reduce its military footprint and stop spending so much money on wars overseas — a view the Tea Party has helped bring to prominence. Romney set himself apart from that camp Friday, arguing that a weaker military and a smaller global footprint will compromise America's leadership in the world. "The United States should always retain military supremacy to deter would-be aggressors, and to defend our allies and ourselves," he said. Romney said he wants to increase the military budget, mentioning specific projects from naval shipbuilding to a missile defense system. It's a traditional Republican view of defense that was music to this crowd's ears. Foreign Policy: What Does Mitt Really Mean? "I really enjoyed the speech," said 19-year-old Sebastian Clark of Pittsburgh. "I believe that what he said is true, that during times when America is not very secure in our finances, we need to upscale our military in order to protect our borders and our allies and our interests worldwide." Romney said that while America should work with other nations, it should "always reserve the right to act alone to protect our vital national interests." That's the same position President Obama has taken, but you wouldn't know it from Romney's speech. He was unrelenting in attacking the president, saying Obama has weakened America's economy, defense and values. "This is very simple," he said. "If you do not want America to be the strongest nation on earth, I'm not your president. You have that president today." At the White House, spokesman Jay Carney argued that Obama's track record on national security is unassailable. "We are stronger, we are safer, we have taken the fight to our principal enemy with a level of aggression and success that is unprecedented," Carney said. "We have improved our relationships around the world with our allies and our partners, and we have made great strides." But in South Carolina, even in this bastion of military values, Romney's supporters acknowledge that foreign policy will not be what decides this election. "The war is certainly important, but what touches people personally is the economy," said Michael Harayda, 20, of Peoria, Ill. "And with people hurting so badly economically, I think that is what voters are going to vote on." Friday's speech came a day after Romney unveiled his foreign-policy advisory team, which includes many top officials from the recent Bush administration. A Romney campaign official was asked Friday where Romney's foreign policy differs from that of President Bush. The official replied that it's not a dramatic departure in policy, but problems like the Arab Spring present challenges today that Bush never faced.